Responding to a New York Post report stating that more than 300 New York City municipal employees didn’t earn enough to be able to afford a place to live, the mayor has offered to find them permanent housing. During a press conference on Monday, New York Mayor Bill de Blasio admitted there were people working for the city that were homeless, though he disputed the number initially reported. “What we’re facing now, this is becoming more and more of an economic problem. Meaning people have been displaced from their homes by the high cost of housing, even if they’re working,” de Blasio said at City Hall. The mayor questioned whether the number of homeless city employees was over 300, with his spokeswoman Ishanee Parikh saying records showed that only 83 shelter residents have identified themselves as city employees. Municipal union leaders told the Post, however, that the actual number is over 300, but many don’t report their employment status to shelters out of shame. “There’s a social taboo that they believe comes with being homeless,” Joseph Puleo, president of Local 983 of District Council 37, the city’s largest blue-collar municipal-workers union, told the Post. “I cry every night thinking this isn’t really happening, but it is,” Angelo Torres, 45, told the newspaper. Dilcy Benn, president of Local 1505, told the Post that more than 100 of the 1,000 park workers she represents are living in shelters. At least another four, including Torres, are living on the streets of Staten Island and the Bronx. A Sanitation Enforcement Agent, Georgie Grier, makes around the same amount of money and lives in a city-run homeless shelter called the Aladdin Hotel. “There’s a lot of addicts. It’s very scary, and I am losing a lot of weight,” she told the Post. The city pays shelters $78.80 per day, or $28,762 yearly, to provide a single person with space. To house homeless families, the city pays $105.37 daily, or $38,460 per year. In 2015, the Coalition for the Homeless found that nearly one-third of working homeless families currently earn too little to afford the rent for an apartment at market rates. “The pre-tax income of a minimum-wage earner working 40 hours per week – $1,400 per month – is still below the $1,481 monthly “Fair Market Rent” for a two-bedroom apartment,” said the report. It also stated that the widening gap between income and rent has contributed to a rising number of evictions. Between 2005 and 2014, the number of evictions in New York City rose from 21,945 to 26,857. However, that data only accounts for evictions actually enforced by a city marshal, and doesn’t take into account the larger number of informal evictions. 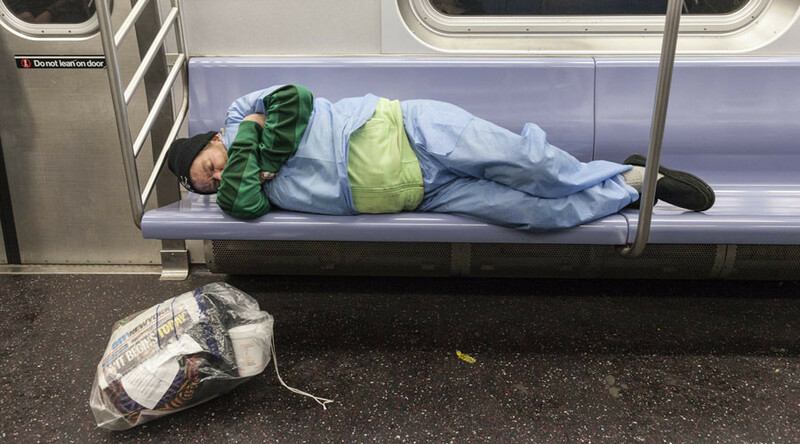 The report found 60,000 people, including 25,000 children, sleep each night in a New York City shelter.